Asthma can trigger off due to various factors so it is important to take control of these factors that may influence a person adversely resulting in the manifestation of the symptoms. Diet is very important in controlling and even correcting certain symptoms. 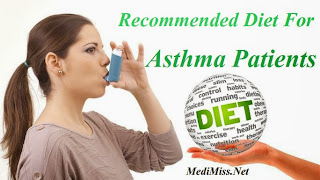 It is very important thus to have proper diet regulations when dealing with asthma. Diet is dependent upon the age of a person and so it becomes extremely important to take care of the age of the patient before planning the diet. The general guidelines to be followed remain very straightforward. It is imperative to keep the diet very simple and without much spices. It is important to not eat very heavy meals as they generally tend to put additional pressure over the system. At night time it is absolutely necessary that an asthmatic person should never ever take a heavy meal because it may cause discomfort in breathing and may even lead to an attack. Several food allergens cause allergic reactions leading to triggering off of asthmatic symptoms. Many food additives create adverse reactions in the asthma patients so they are best avoided. Also excess consumption of sweets leads to exertion on the system which may cause trouble in breathing. The food that is fried and oily should also be avoided so as to not put undue pressure on the system. Sour food items like chutneys and pickles should also not be consumed as they may cause coughing and lead to undue pressure on the chest region. Asthma patients should also concentrate more on eating vegetarian diets rather than non vegetarian ones because of the same reason of avoidance of pressure exertion on the system. The diet regulations have to be followed for life so it is better to induce variety in the diet so as to overcome the general feeling of monotony and boredom. The patients should also be encouraged to eat lighter and more frequent meals than heavier and standard meals. Also care should be taken to have the dinner at least two hours before sleeping time so that the system is relatively relaxed owing to stomach being almost empty at night time just before sleeping. Certain special recommendations have to be followed while deciding the diets of asthmatic children and elderly people. Diet for children suffering with asthma: The asthmatic children tend to lose weight more rapidly than they ever can manage to gain. The basic metabolic rate of a child is higher than an adult and the children also engage more in hectic physical activity. The stage of the body is fast changing and supposed to be rapidly growing so more calories are needed to support the growth requirement of the body. The calorie requirement of a child's body is much higher than that of an adult for all these reasons. The children need more of proteins and carbohydrates. Their diet needs to be balanced for vitamins and minerals also so that no extra supplements are needed by the body. So care should be taken to keep the diet of asthmatic kids well balanced in all respect and at the same time they should not be made too heavy in any nutrient as that would unnecessarily cause extra pressure on the child's system. Care should be taken to not make the diet too oily or too spicy. Too much of cooking destroys the nutrient levels of the food and the food thus will not be able to meet up with the nutritional requirements of the body. Oily and spicy food will also cause much of stress on the system which is best avoided in asthmatic kids. The child's diet should not have sour items as they can cause coughing and sore throat. The meal hours should be fixed and not many changes should be done in them very frequently. Along with the nutritional content of the food it is best to keep the variety and likes and dislikes of the child in mind before serving a meal. It is best to avoid monotony as the kids grow bored very quickly and need to have their interest enlivened all the time. Water intake of the child needs to be carefully monitored and the child needs to be encouraged to consume more water. This is helpful in counteracting the sweat that is secreted often during the attacks and at other times. The sweets should be allowed to be consumed in very little quantities. A regular pattern of a healthy and wholesome breakfast, nutritious lunch and a light dinner is very important to be followed. A heavy dinner at night is the main culprit behind causing night time attacks. Diet for elderly people suffering with asthma: In the old people the physical activity is less and so their calorie requirement is also very less. This makes it very necessary to follow all the other dietary regulations that have been previously described.